Video interviews are on the rise. They’re more affordable than traveling and offer a better opportunity to gauge personality and communication skills than telephone calls. Whether you’re looking to relocate or just trying to connect with potential employers around busy schedules, video interviewing is a great opportunity. By the time you’ve got an interview on the books, they’ve already seen your resume. So the point of the interview is to connect with the hiring manager, not just relay information. In a video interview, they want to know your personality and see how you describe your experiences and skills. 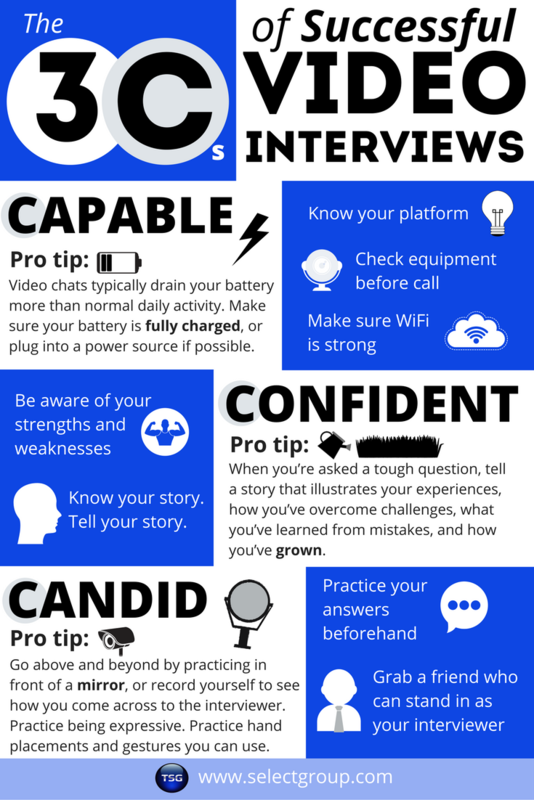 To set yourself apart and have a memorable video interview, focus on embodying the 3 Cs: Capable, Confident, and Candid. Technical difficulties aren’t always your fault, but they can be perceived as signs of incompetence. To combat this, do everything you can ahead of time to make sure it will run smoothly. Make sure you know the platform being used (Skype, FaceTime, WebEx, GoToMeeting, etc.) Download any necessary software ahead of time. Know who is starting the call. Avoid that awkward moment when both people are waiting for the other one to call. Check your camera, microphone, and speakers for clarity. You don’t want to be shouting or continually asking them to repeat themselves. Make sure you have a strong internet connection that won’t drop or cut out. If you’re on public Wi-Fi, make sure the video quality won’t be poor. Pro Tip: Video chats typically drain your battery more than normal daily activity. Make sure to fully charge your battery, or plug into a power source if possible. Just like a regular interview, you should dress appropriately for the occasion. Even though there’s a good chance they won’t see anything other than your head and shoulders, be fully prepared in business attire from head to toe. As tempting as it may be to pull a Ron Burgundy and rock the suit top with no pants, it is strongly not recommended. You want the interview to be all about you and the interviewer, so make sure there are no roommates, pets, or baristas running around. The background should fade into the background – make it a nonfactor. The surrounding area doesn’t have to be fancy; a blank wall is fine. You don’t need to set up a professional three-point lighting arrangement. Just make sure you are clearly visible. Pro Tip: If you’re next to a window, make sure the blinds don’t cast horizontal lines across your face. It’s important to understand the difference between confidence and cockiness. Confidence comes from knowing yourself and being prepared, while cockiness comes from overestimating your abilities. One study on video resumes found that high levels of self-promotion were “ineffective for male applicants and potentially detrimental for female applicants.” Rather than bragging on yourself, confidence will naturally shine through when you know your strengths and weaknesses, research the company and job description, and prepare all the logistics ahead of time. So how do you find the perfect balance, showing both confidence and humility? When you’re asked a tough question, tell a story that illustrates your experiences, how you’ve overcome challenges, what you’ve learned from mistakes, and how you’ve grown. Wrap up each story with what you learned, how it helped prepare you for this specific job, and how it will ultimately bring value to the company. You don’t have to be a polished public speaker or stand-up comedian – just practice telling your story. We can all recognize when someone’s answer sounds scripted, canned or phony. You don’t want to sound like you’re just repeating a memorized statement, but you also want to be fully prepared. The best way to achieve this balance of being candid and prepared is through practice. Research the company, and read through the job description. Then grab a friend and spend five minutes talking through how your experiences make you a good candidate for that specific job. Pro Tip: Go above and beyond by practicing in front of a mirror, or record yourself to see how you come across to the interviewer. If you’re too monotone, practice being expressive. If you’re fidgeting too much, practice hand placements and gestures you can use. Even though you aren’t there in person, video interviews give you the chance to have face time with your interviewer. There’s a real opportunity to connect with your interviewer when you can see each other. This is a big advantage over a phone interview. One study on different types of interviews found that face-to-face interviews received significantly higher ratings than telephone interviews. Video interviews are similar to real-life interactions, where people pay more attention to your body language and tone of voice than the actual words you say. Video interviews are often a courtesy on the part of the employer. They’re doing you a favor by not making you travel to them in person, so be respectful, and honor their time. It’s always good to convey a sense of gratitude, so be sure to express that you’re thankful and excited about this opportunity.